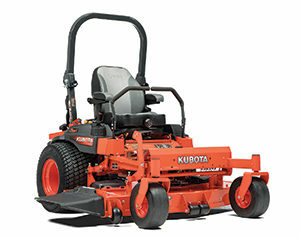 Frank Seems, owner of Seems Landscape Design in Belmar, N.J., just recently started purchasing Kubota mowers when he determined they were better quality and a better price than what he had been using. Brian Lonergan, president of Ace Outdoor Power Products in Bayville, N.J., is Seems’ dealer. He suggested the company give Kubota a spin. After the crew demoed some equipment and found they liked it, Seems purchased three Kubota mowers: Z725 (60-inch) and Z723 (48-inch) zero-turns and a WG14 (36-inch) walk-behind. The company’s mowing crews use the mowers to trim the turf on residential, commercial and industrial job sites. The three Kubota mowers Seems purchased all run on gas. Their maintenance is handled in-house, and the crew at Seems Landscape Design is used to working with gas-powered machines. According to Seems, the operators like the comfort of the machines. The crews typically put about 1,000 hours a year on its mowers, so being comfortable while operating the mower is an important feature. The No. 1 thing Seems likes about the Kubota mowers is the quality of the cut they produce. “It was a very nice cut,” he says. “We got the vacuum bagger attachment, and it saved us a lot of time and work. Once we acquired one and used it and liked it, we purchased another one.” With plans to purchase two more this spring, it looks like the size of the fleet will keep on growing.